We were living in Arizona when we decided to move to Amsterdam. Our flight to Amsterdam left from Boston, so we had to drive clear ‘cross the United States in the space of a few days. This is the story of those few days. After cannonball-running our way halfway across the continent, spending time right smack in the middle of the American map at my parents place in St. Louis felt like downright pampering. There was no seedy hotel to check into, no wrangling of a basset hound into the hotel room behind the clerk’s back, and no heated internal debate over whether or not the glasses left near the sink had been washed in the toilet. Hey, it happens, I saw it once on A Current Affair. Nope, my Mom washes the glasses in the dishwasher and the next two nights became a blur of family time, sifting through storage, eating St. Louis-style pizza, and saying “goodbye until we Skype”. Then, it was off to Ohio. To say I am familiar with the strip of Interstate 70 between St. Louis and the Ohio state line would be what some, including me, would call an understatement. I have made this journey easily over 100 times due to the fact that I fruitlessly toiled and was technically considered a “student” at a university in Dayton off and on for a half a dozen years. I know this trip like the back of the books I never opened. How do you know you’re truly on your way? 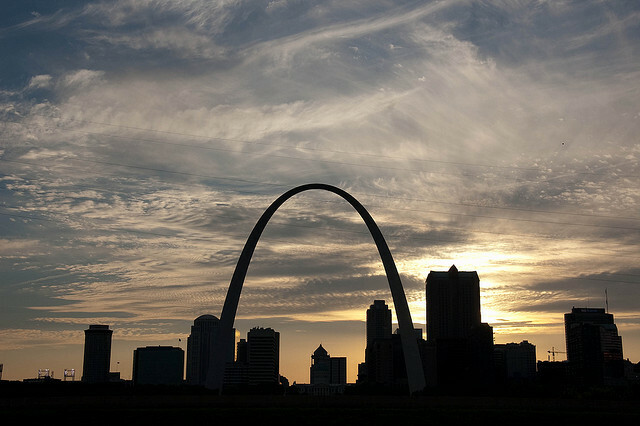 Well, you see the skyline of St. Louis and its Gateway Arch fade behind a mountainous Illinois landfill. Soon after, perched on a hill, you pass what used to be an old crusty hotel home to an under-21 nightclub called Excalibur. The dilapidated Days Inn has since been replaced, renovated, and turned into lofts (what building hasn’t? ), but you still take a second to remember the time one of your friends did his best King Arthur impression by managing to pry a massive, seemingly immovable strip of wood away from Excalibur’s bar with his bare hands. You laugh when you recollect how he then decided to take this piece of timber with him on to the dance floor and swing it violently around his head before he was asked to vacate the premises. First logical stop for a snack or gas? Well, that’s Effingham, Illinois, about 100 miles into the journey, or 45 minutes past the “Pocahontas Palace”, one of the prettiest prisons you’ll ever see in your life. 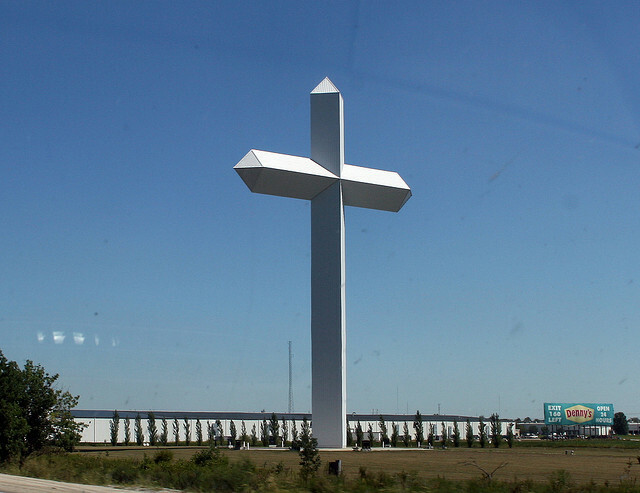 You know you are in Effingham when you see the King-Kong sized crucifix (or world’s largest lowercase T) greet you on the right side of the road. If you’ve been sinning by speeding or not crossing your “t’s” up until this point, this is probably a good time to ask for forgiveness. Halfway point? That’s Terre Haute, Indiana, home to Indiana St. University where Larry Bird played college ball and more chain restaurants and gas stations than you can chuck up a brick at. Next up? 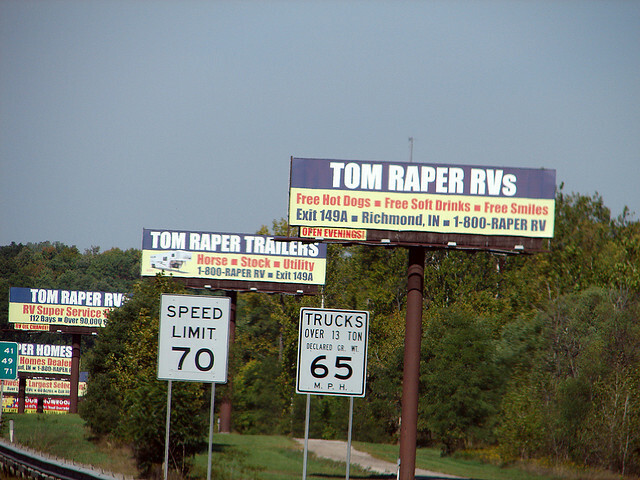 The skyline and sports stadiums of Indianapolis followed quickly thereafter by a disturbing series of billboards for Tom Raper Recreational Vehicles. He refuses to be undersold or change his surname. Home Stretch? 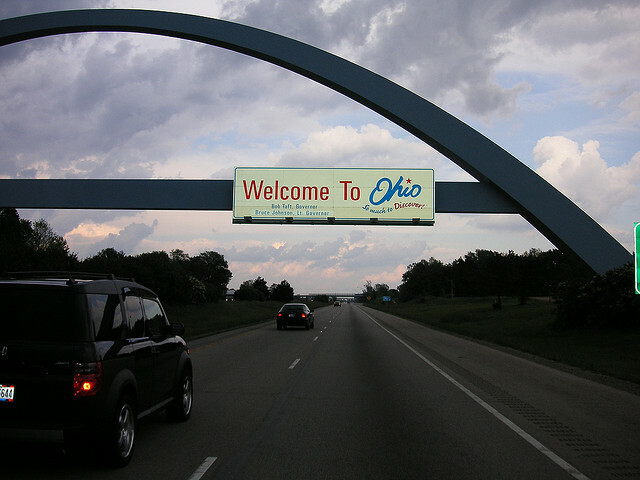 Seeing the second great arch of your journey, this time a steel blue structure that gracefully stretches over the interstate as you enter the great state of Ohio. From here it’s straight on past your first Skyline Chili spotting and on in to Dayton in usually around 5 and 1/2 hours for the full trip. 6 and 1/2 hours on your clock though due to an irksome time zone change. Rumors persist to this day though of a crazy group of kids in the summer of 1998 who shattered that record. The word is that these lunatics left Dayton around daybreak early on a summer Sunday and took expert advantage of a nearly empty highway to average 85-90 miles an hour the entire way back to St. Louis and complete the trip in approximately 4 hours and 45 minutes. “3:45 on the clock with the time zone change, though”, one is said to have bragged during the following years. I guess we’ll never know if it’s true, though. We were now in Dayton, Ohio, and there was only one thing left to to: drive three more hours to Cleveland. After our criminally-quick hit of the Grand Canyon and a long day of pushing the pedal of our rental wagon east, we capped the first night of our AZ to Amsterdam trip with dinner at Buffalo Wild Wings in Albuquerque, New Mexico. The ‘Querque was supposed to be our hotel stop for the evening, but after shuffling out of the “restaurant” in a deep-fried daze, we decided to push on for another couple of hours. Call it wanting to end the day on a higher note than a basket of boneless wings. 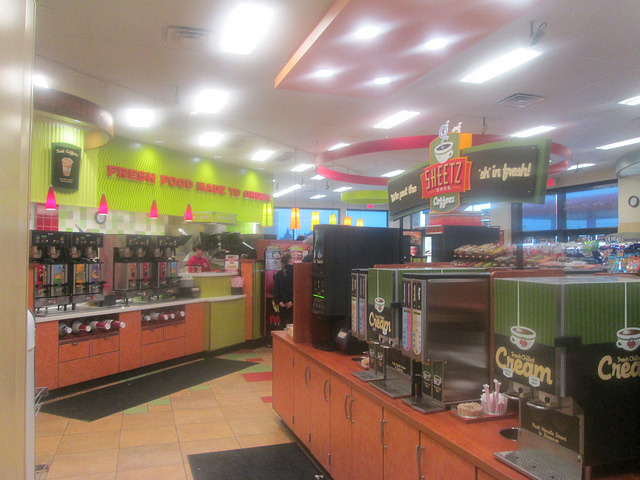 The first stop of our final push was at an energy drink store that also sold gas for cars. I fueled up our car, and fueled myself up on some coffee. I say coffee, but I’m not entirely sure the sucrose spray that spits from those premium cappuccino machines is legally allowed to be called coffee. But since it’s the internet and you can say anything on here, I should be alright. Oh, you didn’t know? That’s right, I go premium cappuccino machine at the gas station, baby. You know the ones I’m talking about. The machines where you put your cup under, hit the button, and then according to the posted instruction, are supposed to release the button when your cup is 2/3rds full. Boy, did I fall for that one the first two or three times. Like a sucker, I let go of that button on the premium cappuccino machine when instructed, and guess what I ended up with? A 2/3rds full cup of coffee. Nowadays, I wait until I see the entire cup filled before I even think about releasing my finger from that rectangle, and I make no apologies with this strategy. While there might be a little spillage over the side, this collateral cappuccino damage is necessary to ensure I get a full cup of coffee for my hard-earned 79 cents, and I think we all agree this is a just cause. With my 3/3rds full cup of coffee in my hand and a bag of sunflower seeds in my lap, we reentered the interstate and pressed on like champs until heavy eyelids forced us to land a couple hours later in Tucumcari, New Mexico. We glided into town around 2:30 in the morning, and as it turned out, just in time to end the evening on that high note we were looking for. I entered the vestibule of the nearest Superb 8 Motel to the exit ramp, twirled my thumbs for a few minutes, then was greeted from behind the glass by a groggy gentleman sporting green hair, wearing makeup and dressed in a ladies nightgown (not that there is anything wrong with that). He was also plainly high as a kite in flight. So high in fact that that he could barely string together a sentence and looked at me with a mix of curiosity and fascination reminiscent of a primate behind the glass at the zoo. You could almost see the cogs grinding in his head trying to figure out where he was, why I was there, and what should happen next. Remarkably, through a bit of primal body language, slurred speech, and hand motions, we managed to hammer out a deal for a room for the night. His motor skills also shockingly allowed him to hand me the keys, collect the cash, and then stagger off to the back of the office mumbling something about someone having a good night. I don’t want to be harsh, but I don’t think that young man has much of a future at Superb 8. I went out to car, let Julia and Holly know about my new buddy, and then we all scurried into the room for the night. We scampered off the next day at dawn with another full day ahead of us and a couple Route 66 attractions to knock off our list. Now, just to be clear, we weren’t “doing Route 66” per say, we were just shooting off the interstate to see a couple of the more noteworthy attractions and to get a little bit of the flavor of America’s Mother Road. Certainly, one day we would like to drive from Chicago to Santa Monica over the course of a few weeks and do the entire Route 66 right, but this wasn’t the time. 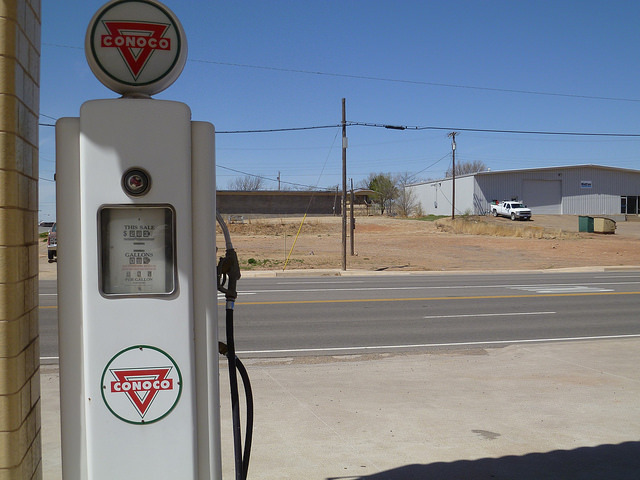 First up was Shamrock, Texas and its famous old Conoco gas station and adjoining U Drop Inn. 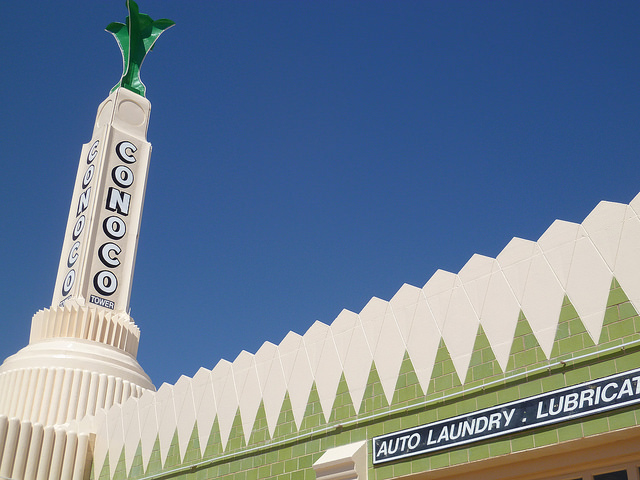 Both of which were bustling landmarks on Route 66 when the route was rife with holiday-maker life. I was pleasantly surprised by Shamrock. I turned up “green”, not knowing anything about the town, but it seemed like a cute little place, and “i-rish” I could have spent some more time there if our schedule would have allowed. In fact, I consider myself “lucky” to have seen Shamrock! The only negative thing we experienced in Shamrock was in the form of a verbal altercation with a fellow tourist. Some photographing hotshot didn’t appreciate the fact that we had the audacity to stand in front of the Conoco station, inadvertently ruining her picture, so barked at us to get out of the way. I responded with a phrase that cannot be repeated here or on any website. Route 66 is dog eat dog, I’m telling you. 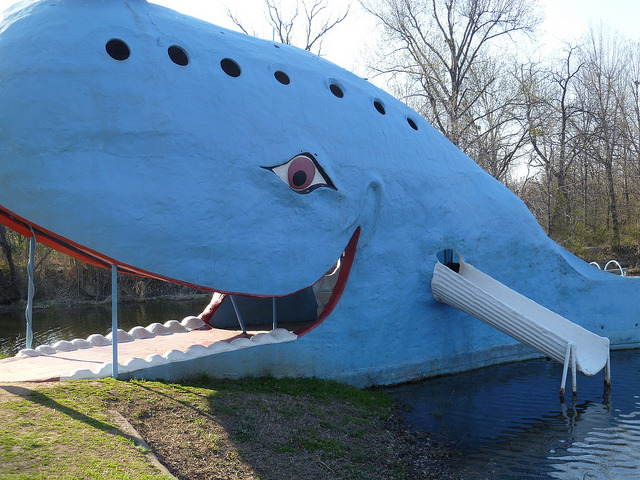 We blew through Oklahoma except for a quick stop at the Blue Whale of Catoosa. What’s the Blue Whale of Catoosa you ask? Well, it’s a giant whale on a lake that some guy built for his kids to play on, but that’s not important right now. What is important is that people from all over the world stop and take pictures with it. Like many of these Route 66 attractions, it’s not that the attraction itself is that spellbinding, it’s just that it offers such an insight into a space in time of America and travel that will be romanticized to the end of time. We ended the day with a disgusting dinner at Wendy’s in Joplin, Missouri that may have single-handedly done more to turn us into the the 98% vegetarian eaters we are today than any other meal we’ve ever encountered. We pulled in to my parents place in St. Louis around midnight, covering nearly 1,700 miles in a day-and-a-half. It was time to rest and relax for a brief two nights before pressing further east. Reasonable people may think that we were nutty for driving from Arizona to Boston in the space of a few days. I have news for reasonable people, it could have been much nuttier. As with a rental car secured and unlimited miles part of the package, I was actually scheming for something a little more certifiably crazy. The way I figured it, if you are going to drive from Arizona all the way to the Atlantic Ocean, you might as well just start on the shores of the Pacific Ocean and make that bad boy a full-on ocean-to-ocean odyssey. I proceeded to excitedly informed Julia and Holly that we should leave a day early and head to California. “You know, we could dip our paws in the Pacific, have some fish tacos, maybe even kick a Kardashian or two in the shins on behalf of all humanity. Come on, it’ll be fun!” I said. Luckily, they never really considered this latest hair-brained scheme of mine and we set off from Arizona bright and early in the morning of the pre-arranged departure date. We had to make one quick stop before we left town though, and that was at the cable company equipment return office, or as they prefer to be called nowadays, the “solutions store”. We pulled up, parked, and then I went in and chucked our modem to the first warm body I encountered, quickly turning toward the door and the direction of Boston and Amsterdam. “But sir, don’t you need a receipt?” responded the warm body in a curious, half-inquisitive, half-cryptic tone that inspired an exchange between us straight from the gift wrap scene in Love Actually. “Um, no, I’m moving to the Netherlands, I think I’ll be ok.” I replied. “But sir, what if we lose the modem?” he volleyed back to me. “What if you lose it? Should you really be throwing that out there? Anyway, naah, I’m good, you seem like you know what you are doing.” I lobbed back to him thinking it was pretty weird he would suggest they may lose it, but hey, I guess anything could happen in a solutions store at night. With that it was game, set, match, and took my place in line to see a solution specialist while Holly and Julia stayed in the running car. In about the time it takes to call and have a pizza delivered, I was summoned, dealt with accordingly, and then handed my paper solution, which ended up finding a nice home in my wallet for the next few months. 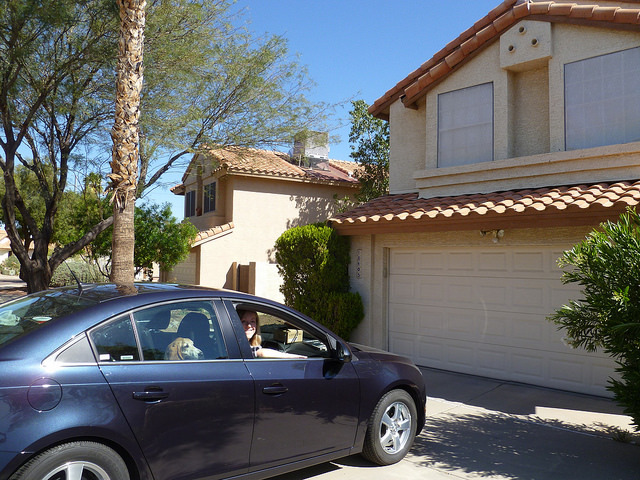 It was time to head east, by way of a slight detour to the northwest part of Arizona. You see, my crazy little scheme about California wasn’t just about the whole coast-to-coast thing or even drop-kicking celebrities, it was mostly about having a good excuse to stop at the Grand Canyon. I had never been to the Grand Canyon, and since we had lived in Arizona a few months, I wasn’t going to leave the state without laying eyes upon it. We entered Interstate 17 headed north from Phoenix to the Grand Canyon area, turned on the cruise control, and then set our sights on the splendors speeding by us. 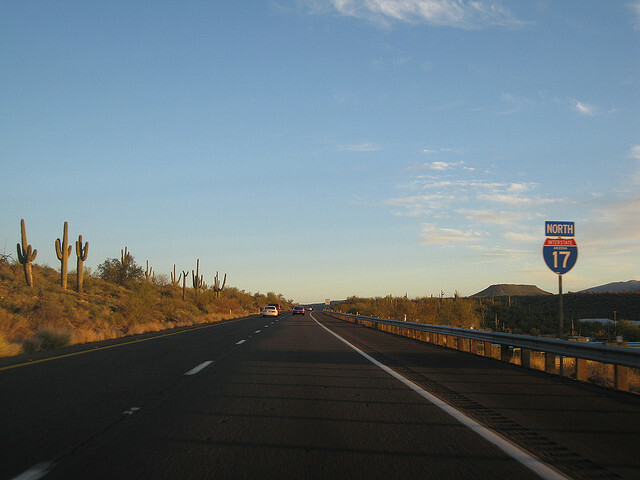 The run of Interstate 17 between Phoenix and Flagstaff is one of my all-time favorite drives. They journey begins on the dusty desert floor of Phoenix surrounded by palm trees and suburban sprawl, scales hills full of cactus and places with names like Bloody Basin and Rabid Badger Springs, skirts the red rocks of Sedona, and then finishes 6,000 feet higher than when you started in the cool air and pine-laden terrain of Flagstaff. All in only about two hours. If there was any part of this entire AZ to Amsterdam adventure where I got a little sentimental about leaving America for for the foreseeable future, it was on this stretch of Interstate 17. And I’m not even from Arizona! It’s just that cool of a drive for me. Once in Flagstaff, we hooked a left and followed the signs to the grandest canyon of them all. 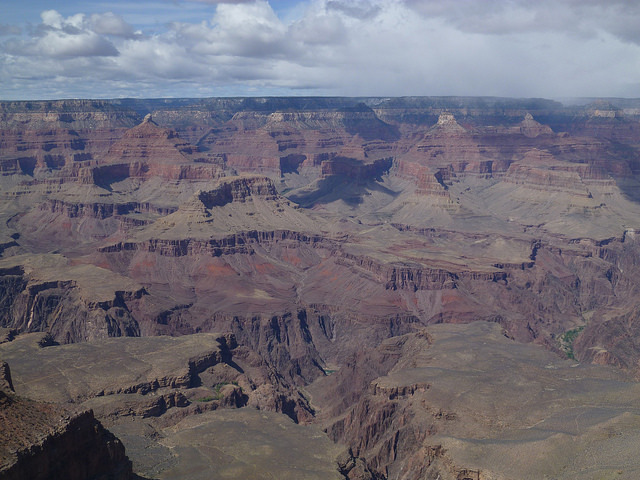 Our time at the Grand Canyon was a rush-job, no question, as we only ended up spending an hour-and-a-half or so total in Grand Canyon National Park. We truly only had time to meander around the South Rim, pose for a few pictures, and badger a park ranger about how long a drive he thought it was from the Grand Canyon to Albuquerque, where we planned to stay the night. The Grand Canyon was as gorgeous as advertised and made me really want to come back one day and spend a few days exploring the park. I’d love to walk on paths, look at rocks and rivers, and maybe even see something called wildlife that the free magazine we got with our admission fee was going on about. We weren’t the only ones inspired by the grandeur of the Grand Canyon, either. 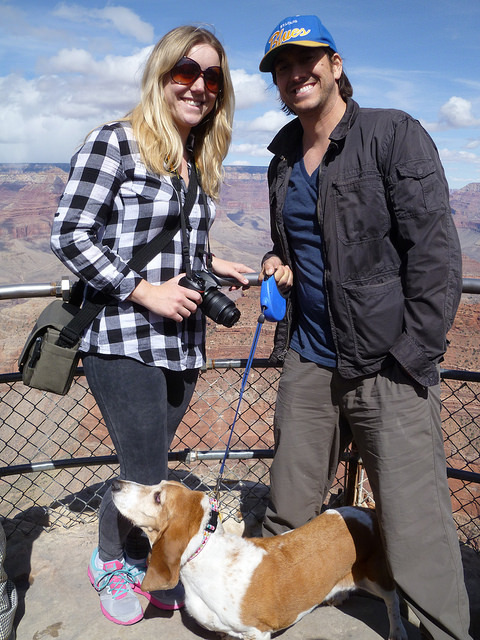 While we were shuffling along the South Rim with Holly, there was a commotion behind us and a gaggle of awestruck Italian tourists started yelling “Bella!” “Bella!” “Bellissima!”. Being from the land of Michelangelo, Bernini, and the hills of Tuscany, they obviously know beauty when they see it, and while they were a bit boisterous, I couldn’t blame them for being overcome. They then approached us, knelt down and … starting petting Holly. It turns out that she had been the object of their attention all along and Holly accepted their pets and ear rubs with the dignity and poise you’d expect from a graceful world wonder. With that, we were back in the car and finally really heading east.